Change your Roadmunk login password. It's always a good idea to change your password on a regular basis. You change your password in the Account Settings Security panel. NOTE: To edit your personal details, change your email address, and manage email subscriptions and notifications, go to Edit your Account Settings. 1. 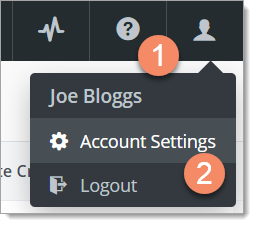 On the Roadmap navbar, click the Account icon. 2. In the dropdown, select Account Settings. 3. In the Account Settings dialog, select Security. 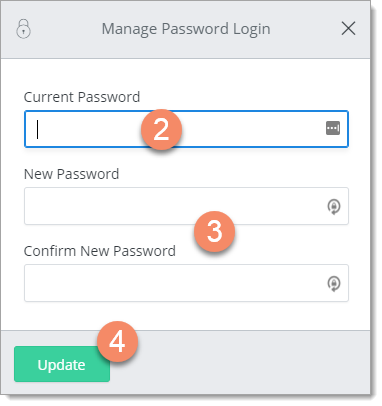 The Security panel shows when your password was added and when it was last used (your last login). 1. In the Security panel, click the Change Password button for the password you want to change. NOTE: Roadmunk supports multiple login methods. If you have more than one method set up, you'll see them listed, each with its own Change Password button (to add a new login method, see Add a new login method). 2. In the Manage Password Login dialog, enter your Current Password. 3. Enter and confirm your new password. The password change takes effect right away. For better security, you should log out and log back in with your new password.